I recently bought this photo on Ebay, but the information on the back is somewhat limited. JR 688 is a B32F Burlingham bodied Leyland Lion LT5. There are no dates on the back, but the model was only in production from 1932 to 1934. From local knowledge I know that the photo was taken by the Victoria Hotel in Whitley Bay, my guess would be around the mid 40’s, the picture quality is not the best, but the vehicle looks a bit sad by Hunters usual very high standards. In an Omnibus Society newsletter for September 1952, I have found a fleet list for Hunters. Unfortunately, it doers not give dates new, but confirms that JR 688 was a Leyland LT5 with Burlingham B32F body. It was no. 8 in the Hunters fleet and was sent for scrap in July 1952. As you have the actual photograph, use a magnifying glass on the headlights, I think they have wartime masks on them. Hunter’s were a family run business who went for quality rather than quantity. They bought well in the first place, and as we’ve seen before on this site, their vehicles were well looked after and meticulously maintained. ZV 2428 is probably an age related registration that was issued when the original was transferred to someone’s car. That number is on a vehicle that is part of the N.E.B.P.T. Ltd collection. The vehicle in question belonged to H W Hunter and Sons, and is a Leyland Royal Tiger that they bought new in 1952, it came to them as a Burlingham Seagull, and being 1952, I presume it would have been a centre entrance. In 1966, they had it rebodied by Plaxton as a C43F. This vehicle, EJR 791, has an identical history, so the question is, is this in fact the same vehicle, or was it one of a pair? 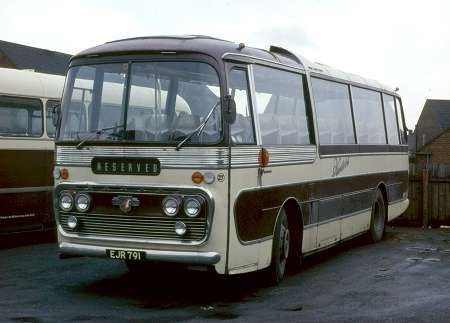 I remember some vehicles in what was then the Les Gleave Group being lengthened and rebodied in the 1960s. Roman City in Bath did the same trick – using Harrington – on at least one Royal Tiger they bought from Ribble. EJR 791, according to the PSVC preserved bus listing for 2012 is indeed ZV2428, at that time with Universal, Portlaoise. I thought ZV and similar registrations are what are popularly known as "Paddy Plates" (I claim Irish blood and am allowed to say this) -Irish registrations with the great advantage of not revealing the (venerable?) age of the coach. These seem/seemed popular with small operators who used them as "personalised" plates. The ZV2428 Number probably means that this coach spent some time in Ireland. The ZV plate is used here for imported vehicles that come under a "vintage" registration class which covers vehicles over 30 years old. Mention of the Les Gleave Group lengthening and rebodying a number of Leyland Royal Tigers brought to mind this photo of one of these coaches taken in Eastbourne in the mid sixties registered 2048 LG the body style indicates the work was carried out around 1961/62. 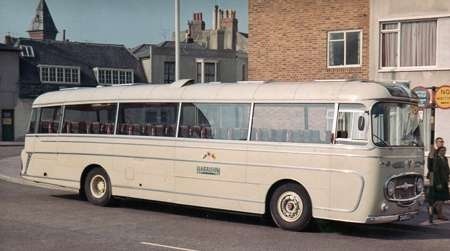 There is a photo of an identical coach at that time belonging to Campings of Brighton registered 501 WLG taken at the 1964 Brighton Coach Rally posted on the SCT 61 Photo Gallery section covering Plaxtons. Only Northern Ireland plates can be used in Britain in the way Joe describes. ZV is used in the Irish Republic, as David suggests, when registering a vehicle older than 30 years. It is the same vehicle. EJR 701 is a Leyland PSU1/15 which was new to Hunter’s in March 1952 as their no 19; it had a Burlingham C41C body. 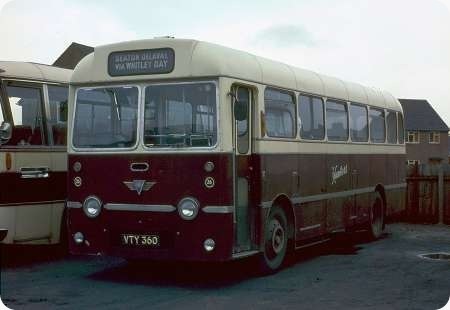 In January 1966 it was rebodied by Plaxton to C43F and renumbered 27. In June 1977 it was acquired by OK Motor Services. In January 1984 it was transferred to Lockey’s which had itself been acquired by OKMS in October 1983 and was functioning at the time as an OK subsidiary; EJR carried the ‘Lockeys Burn Line’ fleetname, but OKMS livery. In August 1985 it, together with the rest of Lockey’s extant fleet, returned to OKMS with whom it remained until June 1987. I like the zero-(or possibly negative-)offset front wheels on the lengthened Royal Tiger from Diesel Dave, which give the bus a real heavy-vehicle look. One reason that I dislike wheel-trims (especially those ghastly wobbling chrome things) is that they obliterate much of a vehicle’s identity and character, and can add difficulty to a historian’s job. Thankfully, no such nonsense with 2048 LG! Still with H W Hunter. Looking a bit grubby with the days road dirt still wet, VTY 360 was new to Hunter’s in April 1962 and was their second AEC 2MU3RV Plaxton Highwayman B45F, the first being TJR 573 delivered in May the previous year. If my records are correct it was also the last new single deck bus they ever bought. In common with many bus/coach operators they still purchased a couple of new coaches, but rather than buses they opted D/Ps which gave them a far greater degree of flexibility as to how they could utilize them, one result was that ‘certainly in this area’ they were possibly the first to use Volvo’s on ordinary stage carriage work. A full list of Reliance codes can be seen here. Thanks for posting, Ronnie. Would I be right in thinking this was the Plaxton answer to the BET standard design? Plaxton tended to plough their own furrow and didn’t get terribly BET until the Derwent. I was told, or read, that the Highway was based on Roe’s standard underfloor single deck design. 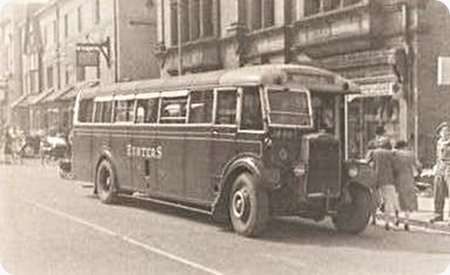 Source "Plaxton – 100 years" (Stewart J Brown). The Highway was introduced in 1957 at the request of OK Motor Services and based on a contemporary Roe design….. (illustrated in the book on page 37). Yes Chris, that’s what happens when you’re imprecise with your use of language. I am aware of that – the Derwent in it’s time had a number of incarnations. Sorry for being lazy!